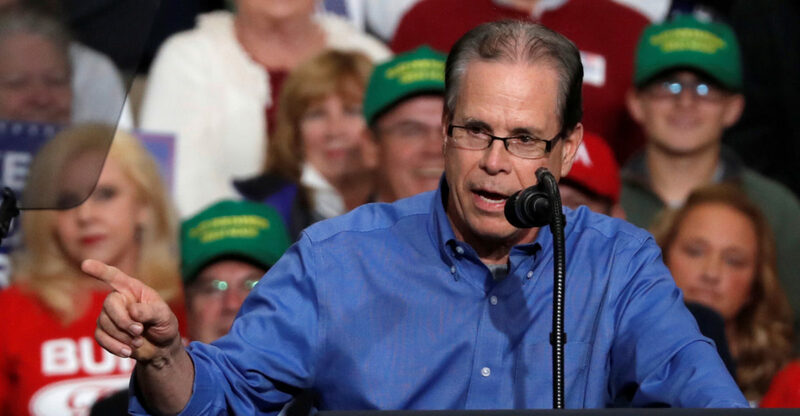 In a major win for Senate Republicans, businessman Mike Braun has defeated Indiana Democratic Sen. Joe Donnelly, likely securing the GOP’s hold on the upper chamber of Congress. The outcome follows a hotly contested battle that left election forecasters unsure of what would happen. With 49 percent of the precincts reporting, Braun has defeated Donnelly, the incumbent, according to Reuters and CBS News. In the Real Clear Politics average of recent surveys, Donnelly led Braun by 1.3 percentage points, well within the margin of error. Inside Elections and Cook Political Report both rated the race as a toss-up. Given that Indiana voters favored President Donald Trump over Hillary Clinton in the 2016 election, and the state’s former governor is serving as the vice president of the United States, national Republicans long believed the state prime real estate for a pickup. Donnelly, for his part, appeared to shift to the right as Election Day neared. During a debate, the first-term senator suggested he was open to supporting Trump’s proposed border wall. “I’m the only person on this stage who voted three times for a border wall. I voted against sanctuary cities. I’ve stood for secure borders with John McCain when in 2013, we passed legislation that would have provided an additional 20,000 border agents to the border,” Donnelly said a week before the election. The Indiana Democrat also appeared open to Trump’s proposed change to birthright citizenship — although he said he wanted to see it done on the legislative level. Braun, a former state representative, has greatly helped the Republican Party maintain control of the Senate as it battles other close election contests. Braun’s victory in Indiana gives the GOP padding should it lose seats elsewhere across the country. Republicans are defending close Senate elections in Arizona, Nevada and Tennessee.